Worsted Spun vs Worsted Weight. What is the Difference? Wool garments are generally known to be "fuzzy" because that is the nature of Wool, but how come wool suits and kilt material have such a smooth texture along with a nicer sheen and drape than that normally found in handwoven wool fabrics? 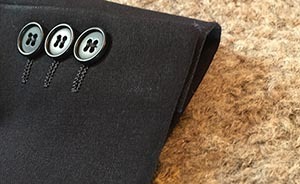 The primary reason for this is that the wool yarn normally used for these fabrics was produced using a special "worsted" spinning technique that better aligns the fibers. When this "worsted spun" yarn is woven it produces fabric with these qualities unlike the more common woolen-spun wool yarns available to handweavers. This can be confusing because the term "worsted" is also used to describe the weight of a knitting/weaving yarn so it is important to know that "worsted weight" and "worsted spun" mean completely different things. Worsted spun wool yarns are more expensive and also harder to find. Camilla Valley Farm provides a line of 2/16 (refered to as 16/2 in the US) 100% worsted spun wool yarn that enables handweavers to produce these "smoother fabrics. 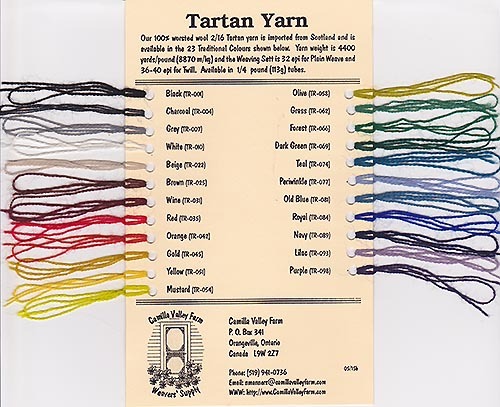 The yarn is produced for weaving Tartan fabric but can be also used for any handwoven project. The yarn is worsted spun and dyed in authentic colours by one of Scotland's oldest tartan producers and is available in 23 colours. Depending upon the sett, the yarn can be woven into a variety of fabrics. The yarn comes in the 23 colours shown in the picture below. See the sample card shown below for the colour listing. 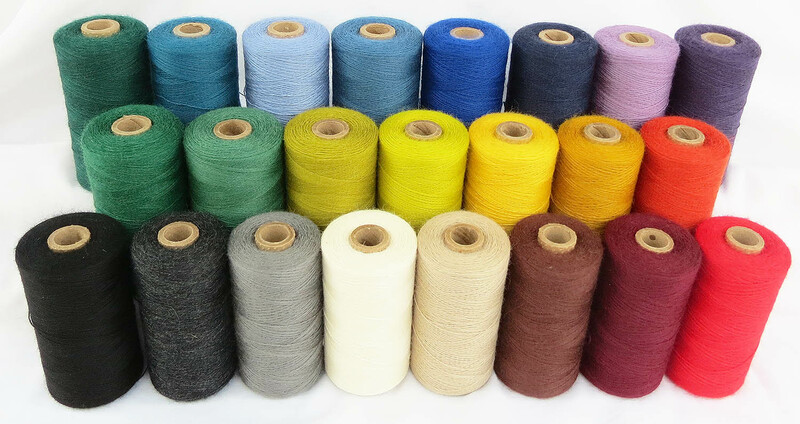 With a yarn weight of 4400 yards/pound (8826 m/kg), this worsted spun wool yarn is available in 4 ounce (113g) tubes resulting in 1100 yards (1006 metres) per tube. We recommend a handweaving sett of 30 epi for Plain Weave and 32-36 epi for Twill. Note that the tartan shown in the background here was machine woven in the mill at about 40 epi. Camilla Valley Farm stocks all colours of our Worsted Spun Wool for quick shipment. Pricing is shown below. 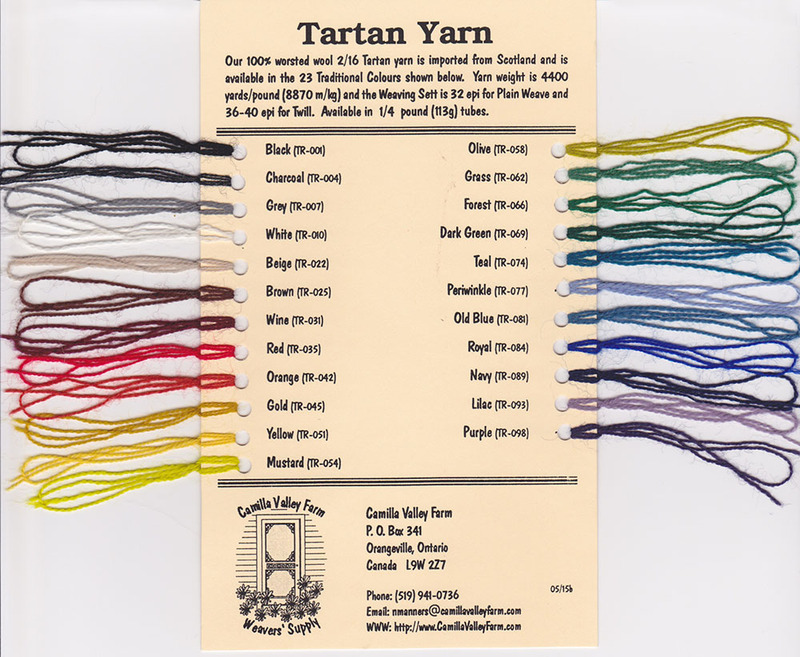 A Sample card that shows all of our Worsted Wool Yarn colours is shown below. While it provides a fairly accurate reproduction of the colours and sizes, their appearance can vary from computer monitor to computer monitor. We suggest you verify colours with the sample card before ordering to ensure your project turns out as expected. Click on the image below for a larger picture of the card.